Have a fingered 'C' Extension? Considering getting one? The ultimate solution for 'C' Extension chromatic latches or gates! Created by a journeyman classical bassist with a second life as a mechanical engineer and designer, Bass Capos have proven reliable for over fifteen years. 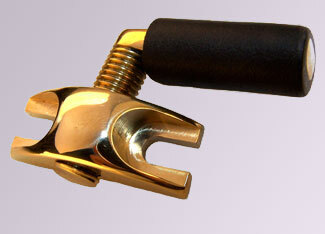 Bass Capos are an excellent choice for any bass player using or looking to implement a double bass extension. Easy to install and adjust, cheaper and more reliable than hand-built latches, also lighter and quicker in operation. What are you waiting for? Bass Capos are not only a welcome component to new extension builds, but also an easy retrofit to most existing extensions, including keyed extensions. There are limitations of course – check the installation page. 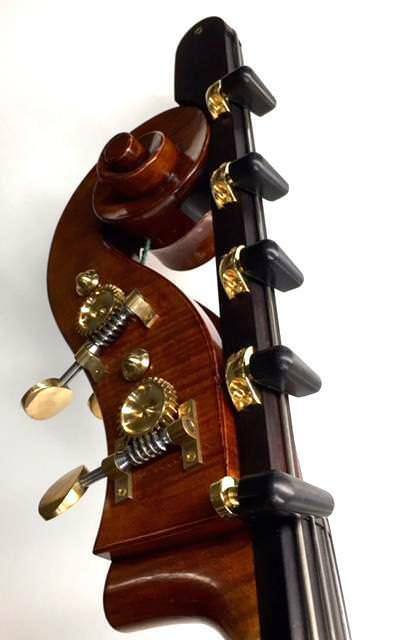 Bass Capos are currently being used by double bassists in about 20 countries. Major Orchestras include the New York Philharmonic, Metropolitan Opera Orchestra (New York), Boston Symphony, Tonhalle Orchestra of Zurich, Royal Stockholm Philharmonic, National Symphony (USA), Wiener Symphoniker, The City of Birmingham Orchestra, and jazz bassists around the world. When a luthier hand-builds a closure device, it may be beautiful, but without the maths, research, and machining expertise, performance is unlikely to be optimal. 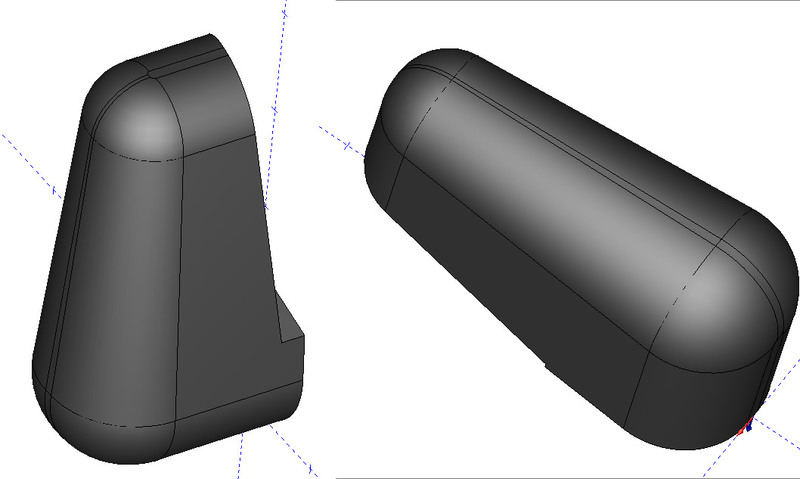 Bass Capos have been designed, researched, and exhaustively tested to work on almost any extension. 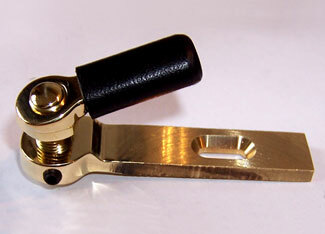 They are precision machined in brass and all the angles and geometry have been carefully calculated. Also, unlike most handmade closures, Bass Capos are made to be easily adjustable, virtually maintenance free, and cost much less than hand built latches. Some players either prefer a wood finger for aesthetic reasons, or they are simply more comfortable with a larger surface to grab. These can also be done in other woods. For example, It is a nice touch to match the color to your scroll varnish! Photos credit to Michael Griffin, creator of this bass and the extension. 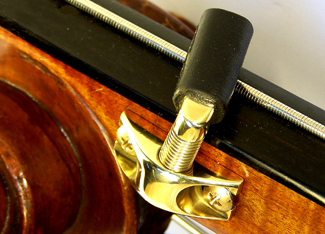 Double bass 'C' Extension Capos, also known as chromatic latches, closers, or gates, attach to the fingered extension, giving the player added capability when playing the extended notes. By stopping a note on the extension with the Capo, the note temporarily becomes effectively an open string, and need not be stopped with a finger. 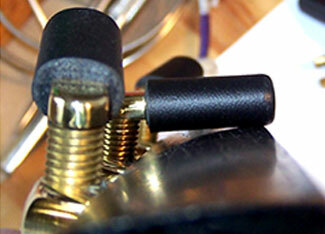 This reduces much of the technical disadvantage associated with fingered extensions. Anzellotti Bass Capos offer an advantage over other 'C' extension closures in that they are easy to install and adjust compared to handmade latches, and they were carefully designed and engineered to maximize performance.